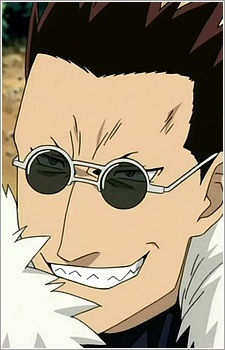 Greed is a greedy Homunculus, nicknamed the "Ultimate Shield". He is able to rearrange the carbon in his body to make his skin as hard as diamond, thus making himself almost impossible to injure. As his name implies he is a very avaricious character, who likes living in luxury, surrounded by powerful minions and beautiful women. Despite his generally greedy nature, he is shown to honestly care for his subordinates. He also has a habit of flipping people off in the manga. Greed is the second oldest of the Homunculi created by Dante. However, due to his avarice, Greed rebelled and was eventually captured and imprisoned in lab 5. He was imprisoned for 130 years until an explosion broke his seal. He then freed the caged chimera at Lab 5 in exchange for helping him get his revenge on the other homunculi and their master. He is the third Homunculus created by Father. Greed apparently abandoned the other Homunculi over 100 years before the start of the series and claims to be around two centuries old. He first appears hiding in the Devil's Nest in Dublith, with his gang of chimeras all of whom he apparently rescued from military experimentation. After Greed is punished by Father, he later returns as Father removes his son's Philosophers Stone core from his own body and inserts it directly into the body of Ling Yao to create a second Human-based Homunculus. This second Greed maintains all the same personality and powers as the first (his Ouroboros tattoo is even in the same spot), but appears to have none of his previous memories, not recognizing Envy, Gluttony or the Elric Brothers. As such, he becomes a faithful servant of his Father, as the first Greed was presumed to have been initially, and refers to all actions prior to his rebirth as having been done by "the other Greed". However, as Greed is a host in Ling Yao's body, Ling is able to regain control of his body if Greed let's his guard down or allows him to. By doing this, Ling is able to regain his sixth sense of detecting another's presence, but is not able to use the Ultimate Shield. Greed is reluctant to willingly give him back his body however. After killing a past comrade and follower of his, memories from Greed's previous life returned, including his time in the Devil's Nest and the feelings he had for his followers. Remembering this, along with how Bradly killed most of his followers, leads Greed to betraying Father once again. He also stops referring to his "previous self" as "the other Greed" upon regaining his memories. After forming a temporary alliance with Edward and company, Greed and Ling help in the fight against the Homunculi and the Central Troopers. In the afternath, as Edward, Alphonse and the military engage Father, he steps in and allows Father to absorb his Philosopher's Stone, afterwards giving Ling his body back, claiming the only thing he truly wanted were friends. He then reverses his Ultimate Sheild, turning Father into a brittle coal-like substance and fades away with his Father, a smile on his face.